1. 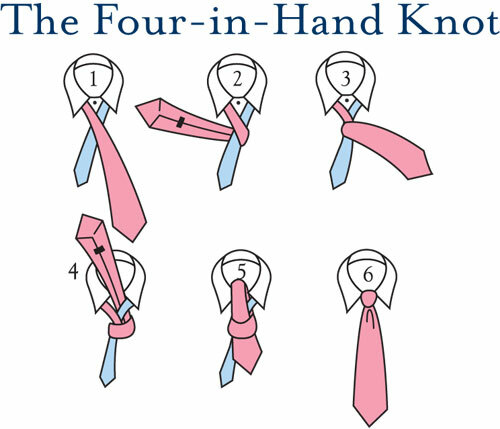 Adjust your tie so that the left side is slightly longer (blue) than the right (pink). 2. Cross the long end over the short. 3. Bring the long end through the center hole, at neck and tighten knot. 4. 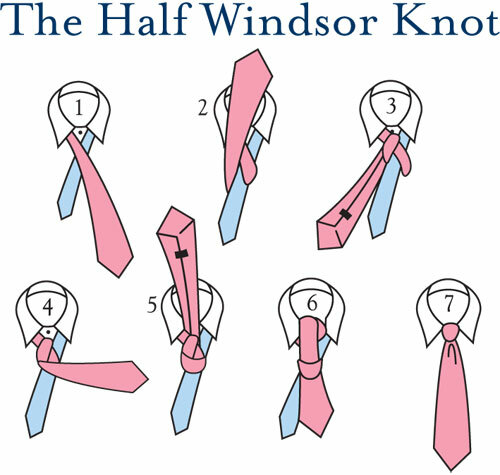 Form a bow with the short end of the tie, line it up horizontally with the points of your shirt collar. Bring the long end over the bow. 5. Fold the bow made from the short end together around the longer end with your left thumb and forefinger. Pull the folded bow forward. 6. By pulling the bow forward, you create a small opening behind which you will push the new bow made from the longer end of the tie. 7. Tighten the knot by adjusting ends of both loops. 1. The wide end (pink) should extend about a foot longer than the narrow end (blue). Cross the wide end over the narrow end. 2. Bring the wide end underneath the narrow end. 3. Cross the wide end over the narrow end. 4. Pull the wide end up through the center hole at neck. 5. Bring the wide end down through the loop in front. 6. Using both hands, tighten the knot carefully and draw up to the collar. 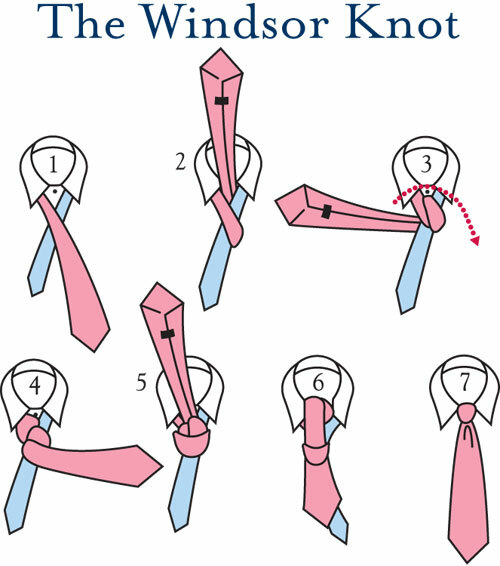 Pinch the base of the tie (at bottom of knot), placing forefinger between the crease, making a dimple. 2. Pull the wide end up through the center hole at neck. 3. Pull the wide end over the knot, and back under the narrow end. 4. Bring the wide end over the front of tie from right to left. 5. Pull the wide end through the center hole, at neck. 6. Bring the wide end down through the loop in front. 7. Using both hands, tighten the knot carefully and draw up to the collar. 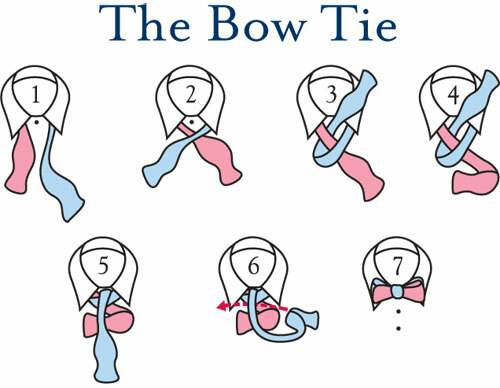 Pinch the base of the tie (at bottom of knot), placing forefinger between the crease, making a dimple. 2. Bring the wide end back underneath the narrow end. 3. Pull the wide end up through the center hole at neck. 4. Bring the wide end around and over the front of the tie from right to left. 5. Again, bring the wide end up and through the center hole at neck.